Cup cake without eggs. No. 4. 2 cups sugar 1 cup butter 1 cup sour cream or milk 1/2 a gill brandy 1/2 nutmeg 1 teaspoon soda. Flour to make a stiff batter - add plums if you like. Bake in the cakes. Cup cake. No. 5. 5 cups flour 1 cup butter 2 & 1/2 cups sugar 1 cup sour milk 4 eggs 1 teaspoon soda - spice to your taste. 1, 2, 3, 4, Cake. 1 cup butter 1 cup sour milk 2 cups sugar 3 eggs. 4 large cups flour 1 tea spoon soda, nutmeg & cinnamon French tea cakes. Same as Mary's rule. No. 3. 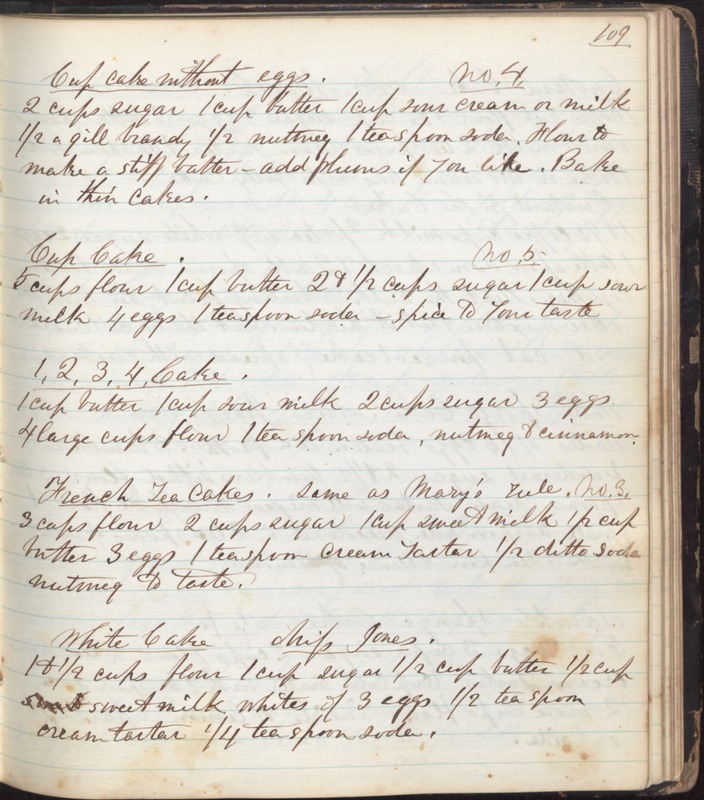 3 cups flour 2 cups sugar 1 cup sweet milk 1/2 cup butter 3 eggs 1 tea spoon cream tartar 1/2 ditto soda nutmeg to taste White cake Miss Jones. 1 & 1/2 cups flour 1 cup sugar 1/2 cup butter 1/2 cup sweet milk whites of 3 eggs 1/2 tea spoon cream tartar 1/4 tea spoon soda.